Imagine being a professional engineer and working for a successful widget company. Your boss comes to you and says, "Make the best widget you can, and dont worry about the cost. What we need is a state-of-the-art widget." If designing widgets is your passion, this is your dream come true. Cant imagine being an engineer? OK, imagine being a kid on the beach. Your parents come to you and say, "Build the best sandcastle ever built on this beach." Looking over their shoulders, you spot a couple of front-end loaders, a small army of laborers, and enough Kool-Aid to fill a swimming pool -- all at your disposal. Resources matter. When the goal of a project is to advance the state of the art, the investment in the project must be equal to the task; when that task is a complex electronic component, the resources needed can be immense. The Japanese brand TEAC has such resources. 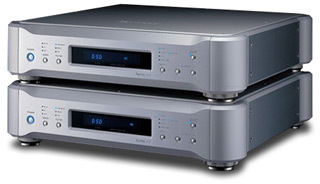 Esoteric, TEAC's high-end arm, was tasked with creating the best SACD playback setup money -- a lot of money -- could buy. For those not familiar with the company, Esoteric has a rich history in the realm of digital design. Their VRDS (Vibration-Free Rigid Disc-Clamping System) transport mechanism has been widely heralded as the best available and has been used by companies such as Wadia to deliver standard-setting CD sound. But forget about what Esoteric has done in the past. When you first see the P-01 transport, D-01 DACs, and G-0s master clock, its apparent that Esoteric has gone beyond any past accomplishments. The five-box rig youre preparing to read about is far more than expensive; all told, in the configuration I was sent, it costs $63,000 USD. It is a sight to behold, and the sonic results are as shocking as the price. The P-01 SACD transport costs $25,000. It is a two-box affair, with one full-size chassis (17.625"W x 6.25"H x 16.625"D, 62 pounds) housing the transport mechanism and its electronics, and another half-size chassis (9.5"W x 6.25"H x 16.625"D, 35 pounds) dedicated to the power supply. The P-01 is compatible with CD, CD-R/RW, and SACD, including multichannel playback. No DVD playback is supported at this time. Digital outputs on the P-01 are extensive. 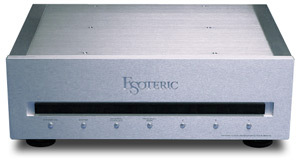 Theres a standard coaxial RCA-type connection, two IEEE 1394 connections, and six XLRs (front left, front right, center, subwoofer, left surround, right surround) that output DSD via Esoterics proprietary ES-LINK format. Three of the XLR connections can also be used with DACs not equipped with ES-LINK. In this instance, one XLR output would contain both the front right and left channels, another the center and subwoofer channels, and the third both surround channels. There are also three coaxial RCA outputs marked FL/FR, C/SW, and SL/SR. These will work just as the XLRs in the non-ES-LINK configuration described above -- six channels of information are output via three connections. These are not functional at this time, but they are designed for the future implementation of multichannel DVD-Audio or some other unnamed format. Ostensibly, these could be utilized by Esoteric to handle future digital concoctions. A word-sync input is available for separate reclocking units such as the G-0s master clock. The P-01 can upconvert PCM material to 88.2/96 or 176.4/192kHz. Esoteric advised me to listen to the P-01 with the signal upconverted to 88.2/96kHz. They explained that in their extensive listening and laboratory tests, this configuration, along with excluding the use of any digital filters (FIR and/or RDOT), produced the most realistic and satisfying listening experience for their listening panels. The centerpiece of the P-01 is the most advanced version of the VRDS-NEO transport mechanism Esoteric has yet produced. First seen in the X-01/UX-1 players, this engineering tour de force is a virtual tank. Some details: The turntable is made of magnesium, which, according to Esoteric, is lighter than aluminum, thereby making it more stable during the increased rotation speed needed for SACD playback (approximately 4.5 times greater than that of CD). Magnesium also reportedly has superior vibration-absorption properties than the other materials the company tested. The VRDS-NEO is all about stability. A pair of pre-loaded "precise ball bearings" is employed in the spindle shaft to reduce transport shaking and rattling. Esoteric says this improves "the correlation between the disc and pickup," thereby making disc reading more accurate. To drive this turntable, Esoteric designed a completely new three-phase, brushless spindle motor using neodymium magnets and computer-aided design of the magnetic field. The massive construction of the bridge, using 20mm SS400 steel, connects to a 10mm bottom plate of the same material. This, along with a new sled and lens design, is reported to make disc reading more precise than with any other transport. Esoteric says that the laser is always on the correct axis and reads from the absolute center of each disc's pit track. The separate power supply connects to the transport via two large multi-pin connectors. The unit houses three power transformers: one for the transport mechanism, one for the signal processor, and yet another for the clock circuits digital processing. According to Esoteric, the power supply utilizes highly efficient "WB"-type transformers. The D-01 mono DAC costs $12,500 each; this means a stereo set will cost $25,000, and a full-blown 5.1 system runs a staggering $75,000. Each unit (17.625"W x 4.25"H x 16.625"D, 43 pounds) comes equipped with a bank of digital inputs: two IEEE 1394 connections, two XLR inputs (ES-LINK), and a coaxial RCA input. Word sync input and output are provided for via BNC connections for hookup to an external clock. The analog outputs are your choice of RCA or balanced XLR -- the D-01 is fully balanced. The user is given the option of three digital filters for CD playback: FIR, RDOT, and FIR + RDOT. These filters can also be switched off completely as well. According to Esoteric, PCM digital signals are upconverted to 768kHz before being sent to the Burr-Brown 1704 D-to-A converter chips (eight of which are in each D-01). DSD, on the other hand, is converted to 24-bit 88.2kHz or 176.4kHz PCM and then sent to the digital filters. So, yes, just as with the X-01 and UX-1, DSD is converted to PCM. The D-01 will accept digital input up to 192kHz. Esoteric claims that D-01 is the very first mono DAC. I havent heard of another, but I can see this starting a trend, which might be good for ultimate performance and bad for your ever-lightening wallet. Claims touting the D-01s technical prowess are many, and they do have some impressive numbers -- a signal-to-noise ratio of 118dB and a dynamic range of 112dB. Jitter is said to be extremely low. The D-01 is equipped with a variable analog volume output (0.5dB steps up to 99.5dB) that can be used to drive your power amplifiers directly. This feature can be bypassed easily via a front-panel-mounted button. The G-0s master clock (17.4"W x 6.1"H x 13.8"D, 40 pounds) costs $13,000. It houses a rubidium oscillator that generates a word-clock signal with a claimed accuracy of .05ppb. In simplified terms, the G-0s syncs digital samples in time so that timing errors, known as word-clock jitter, are lessened before the signal is converted to analog. When the digital signal is reconstructed as an analog waveform, without these timing errors present, a closer approximation of the original recorded sound is attained. This G-0s connects to both the P-01 and D-01 with BNC cables. It is compatible with signals ranging from 44.1kHz to 192kHz. The G-0s has the ability to sync up to three digital data streams via six channels of communication. It can also, for example, sync components outputting signals at various sampling frequencies. The G-0s will sync 100kHz-capable signals for the UX-1 universal A/V player as well as PAL film-sourced material, which is output at 96% of NTSC playback speed (to compensate for PALs 24 frames per second versus NTSCs 25). Beyond all of the technical details and specifications, theres even more to be proud of if youre Esoteric. The build quality of these components is fabulous. The chassis construction of the D-01 and P-01 is a notch above that of the G-0s/X-01/UX-1, which is a notch above the lines entry-level DV-50S, which is itself better built than almost any source component youll ever see. The chassis panels are incredibly thick, contoured aluminum; the connectors are as robust as Ive ever seen; and the operation and feel of the controls are luxuriously smooth. Joint tolerances appear to be ultra precise, too. And if youve got even more bucks in your front-end budget, Esoteric recommends their very own Mexcel cables for connecting the transport to the DACs. The two-meter XLR-terminated cables I was furnished to tether the P-01 to the two D-01s will run you a cool $12,000. The Esoteric digital separates were used in several configurations in my system: balanced with fixed volume, RCA with fixed volume, and balanced with variable volume. Although I did not have ample time to assess each configuration completely, limited listening indicated that the balanced, fixed-volume arrangement was superior to the others. It, by a small margin, provided a more stable soundstage than the RCA output. I also found the fixed volume, in conjunction with my Boulder 1010 preamp, to outperform the variable-volume mode. Routing through my preamp seemed to produce more solid images and a deeper soundstage. The P-01/D-01/G-0s combination set new personal standards in several important areas of musical reproduction. I inadvertently noted the first as I was warming up my system one evening. I was not paying much attention at all to what was coming out of the speakers as I typed a few e-mails stage right of the primary listening position in my room. Like getting a cold rag in the face, I was awakened from my keyboard-induced stupor to hear something revelatory that would start my love affair with these components. The Esoteric system will correct a problem that you may not even notice you have. With volume levels very, very low, important musical details can be obscured, including the delineation and texture of bass notes, ultimate presence and palpability in the vocal range, and the tinkly air around ultra-high frequencies. With the mega-buck Esoteric rig in place, and with the output level quite low, my system brought forth the tiniest details -- those important sweeteners that make the music go from mere sound to the experience of a performance. I was able to hear and feel all the vibrancy present on the recording without goosing the volume control to any significant level. The cymbal work on "Lulus Back in Town," performed by John Pizzarelli and the George Shearing Quintet, is a fine example (The Rare Delight of You [Telarc SACD-63546]). The cymbals are overshadowed a touch by the piano, but the delicacy with which their sound travels across the room is mesmerizing. The playing raised the hair on my arms. This level of detail retrieval is unprecedented in my experience. If you like listening to music late at night when the family is asleep, this will be a revelation. Youll be awash in your favorite recordings without feeling like you need a certain output level to make the music come alive. This characteristic connects from the very first moment of audibility. Determining why this is so is not easy for me to wrap my head around -- hearing it is believing, though. I can tell you what wasnt happening. The sound was not homogenized to make macro and microdynamics congeal, and there was no blunting of dynamic gradations. Perhaps it was that last electronic veil removed from the sound, or maybe it was simply state-of-the-art instrumental separation. Whatever the reason, the effect was addictive and completely served the music. The second characteristic I noted, indisputably related to the above, was the way the Esoteric combination sorted out the soundstage. There was more expansiveness, more depth of field, and more height gradations. If youre an imaging and soundstaging fanatic, as I am, youll take to the way these components re-create the recording venue all around you. I was astonished at the precise placement of instruments, correct sizing of the players, and clean reproduction of ambience as it created the illusion of space my room. I could not help but chuckle out loud on several occasions. The Naxos SACD of David Lloyd-Jones conducting the Royal Scottish National Orchestra performing Holsts The Planets [Naxos 6.110004] was captivating due to the scale with which it was reproduced and the sheer amount of information on the disc. On "Mars, The Bringer of War," as the piece is building to its natural climax, the individual elements in the orchestra can be fully appreciated while the larger work continues to grow around you. The Esoteric separates allowed my system to keep focused even on massively scaled works while -- and heres the trick -- not losing the low-level details. Amazing. It was as if the fabric of the music was woven with a higher thread count. The sound was, in many ways, like high-definition video: greater resolution, which makes for a more dramatic experience. I could hear all of the intricacies and all of the bombast -- nothing was lost or altered. And the sound rocked, too. The SACD of Pink Floyds The Dark Side of the Moon [Capital CDP 7243 5 82136 2 1] contained all the power and drive you could imagine; the tonal colors were cleanly reproduced and the sound was immediate. Discussing warm or cold, fast or slow, tipped up or shelved down is really not necessary. The Esoteric products were really none of these. From a frequency-response standpoint they were simply neutral. I heard what I know to be on the discs I played, plain and simple. This goes for SACD or CD. Laurie Andersons "The Dream Before," from the Strange Angels CD [Warner Bros. 25900-2], possesses an uncommon level of vocal detail. Andersons range allows you to delve deeply into the midrange performance of your system, and Ive never heard her voice sound more real than with the Esoteric separates anchoring my system. She was palpable and relaxed in the most natural of ways. This solidified for me that the Esoteric separates redefine CD performance just as they do SACD -- a fact that might be much more relevant to owners of these components over the long term. Your CD collection will likely be with you for many years, and you can take comfort in knowing that you're getting the most out of it with this front-end. Up to now the best digital playback Ive heard in my system was the Meitner DAC6e ($9995) along with the Meitner-modified Philips SACD1000 transport. The delineation of detail, ambience retrieval, and general sorting out of the soundstage were areas in which the Meitner duo simply outclassed the Esoteric DV-50 ($5500 when available). The Meitner has been further improved with the addition of a matching transport to couple with the DAC6e. To be fair, Ive not heard that setup. What was clear to me as I ran the A/B comparison between the Meitner rig and the Esoteric DV-50 was that there was quite a bit more resolution to be had from the SACD format. The DV-50, of course, is priced lower than the Meitner duo and does do video and DVD-Audio, so this comparison is not quite apples to apples. Although my electronics have changed since Ive heard the Meitner DAC and Philips transport -- from a Halcro dm68/dm8 setup to my present Boulder 1010/1060 rig -- the Esoteric DV-50 has been kept as a benchmark. Ive kept myself acquainted with its sound -- weaknesses and strengths -- regardless of the various system permutations Ive lived with. Upon switching to the full-blown P-01/D-01/G-0s setup from the DV-50, I marveled at how much better my system could sound. It was not unlike switching to the Meitner DAC and transport from the DV-50, only this time the improvement was even more dramatic than what I remember. It became quite clear to me that the Esoteric DV-50 was, to a larger degree than Id expected, the limiting factor in my system. In fact, the Boulder/Wilson/Shunyata combination I have currently is capable of so very much more than I imagined. Low-level resolution was staggering. Playing the Pizzarelli disc, I was amazed at the level of realism I was experiencing. I could hear more drama, an increased level of musical energy. It was as if the musicians were animated in my room. I could hear details clearly that I could only get wisps of with my DV-50. To sum it up, every detail contained on my recordings popped off the page as if in bold relief. With the DV-50 I had to infer those same details, an exercise that takes some subconscious effort. No effort was needed to immerse myself fully in the music with the P-01/D-01/G-0s, and perhaps thats the point. Even with its superlative sound, recommending the Esoteric P-01/D-01/G-0s combination without qualification is tough by any measure. A large part of the allure of this system is its SACD playback, and SACD may or may not be the format of the future. Then theres the fact that the Esoteric separates, being digital components, are likely to be superceded by newer technology quicker than more mature system segments like speakers and power amplifiers. This does not bode well for long-term resale value. In addition, theres no DVD -- audio or video -- supported at this time. Lastly, theres the looming thought of new formats, namely HD DVD and Blu-ray. These are, albeit, still on the distant horizon. But are any of these facts relevant to the purchaser of this rig? Beyond anecdotal discussion, probably not. These products are about being the best digital playback in the here and now. If you can write the check and you want the state of the art in CD and SACD playback that money -- a lot of money -- can buy, it looks like youve found your dream. Just think -- you could be the owner of the coolest sandcastle on the beach.